Students and community members can become certified lifesavers when CPR for the Health Care Provider opens its medical class doors for anyone interested 8:30 a.m. to 2:30 p.m. July 23, in the hall near the Aquatics Center, said Learn to Swim Program Assistant Tre Kramer. Participants in the one-day session will be instructed about rescue breathing and creating unobstructed airways for conscious and unconscious adults, children, and infants according to the Aquatic Center website. The class is taught by American Heart Association certified instructors, Kramer said. The cost is $45 per participant. Kramer said prior to enrolling, participants must pass a knowledge test. He said the textbook for the course, which can be found in the college bookstore, is highly recommended by professionals in helping students interested in passing the pre-test. He said participants would use textbooks and video as well as participate in hands-on activities. They also will take a written test and skills test in order to become certified CPR instructors. Certification cards will be given upon completion of the course, Kramer said. The course’s cirriculum will always be current and new research is a must to protect everyone around, Kramer said. Students also will learn to use an automated external defibrillator, which is used in life-saving situations such as a heart attack, Kramer said. Kramer said learning to use the machine as well as the other information in the class would benefit OCCC students years down the road. “If a person has a chance to take this class (and doesn’t), and someone they know gets hurt, it can be hard to deal with,” he said. He said other dates available for CPR certification classes are: Aug. 6, Aug. 13, Aug. 14, and Aug. 21. 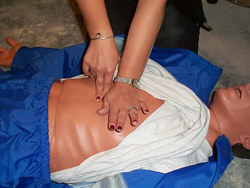 For more information about enrolling in CPR for the Health Care Provider, contact Kramer at 405-682-1611, ext. 7442, or Coordinator of Recreation and Fitness Khari Huff at 405-682-1611, ext. 7481. Students also can visit online for information at www.occc.edu/RF/WaterSafety.